Finished size of the project is 6” x 4”. Gramps is really into birdhouses. His work is prominently displayed around his workshop area. While his part of the yard is not as neat as Granny’s, it is full of fun details--a collection of old wheels hanging on the wall, five birdhouses of various shapes sitting on poles, a barrel with a board on top where he has been painting one of the birdhouses, several birds to perch around the place, a “bird houses 4 sale” sign to place outside the rickety fence and a cat checking out the whole scenario. Extra details to place around the back of the building include barrels, rocks, weeds an a sawhorse. Gramp’s place is a bit easier to put together than Granny’s. The building is constructed from a Grandt Line building kit, with preformed walls, floor and roof. 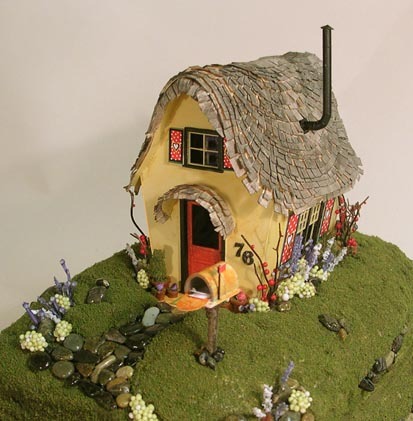 Every thing you need to build this little cottage is included in the kit... rocks, flowers & grass, shingles & smokestack, mounded ground, walls are pre-formed styrene pieces, fun details... tiny flower pots on the door-step, mail in the mail box. Make sure that you build the house before buying furniture, so that the Namfoodle gnomes won't have over-sized couches. The project base is designed to fit flat into a 5" x 7" picture frame. The house is 3" tall. Not a beginner kit. Intermediate level builder can handle it easily. Two banana halves were added to the sides of the building to encourage Bernie's customers to smile and stop for a cold treat. The building can be left open on the back side to allow for your own interior decorating. Umbrella tables, lots of fun signage and a bit of landscaping will make this a fun addition to your collection! The finished project fits into your own 6" x 8" picture frame. Appropriate for intermediate skill level. This kit gives you all you need to create a delicious little fruit stand made from a styro-foam apple. A picnic bench with its own awning offers display space for the tiny produce: barrels of apples, crates of apples, boxes of apples, apple cider, apple jam, and even tiny little apple pies! 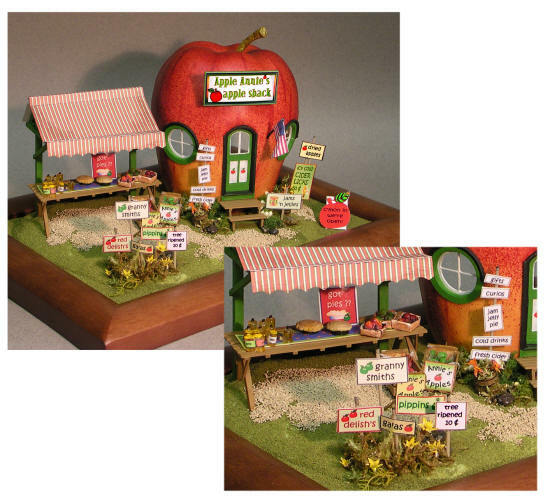 Great signage, a bit of landscaping and great details will make this a fun addition to your collection. The project base is designed to fit flat into a 5" x 7" picture frame. The house is 3" tall. This is not a beginner kit, but an intermediate level builder can handle it easily. Willie is a frugal little gnome....his house is constructed from a recycled water bottle (included) and he has a thatched roof. There are polka dot awnings over the windows, an entry door with a curved top, a mailbox for Willie's fan mail and lots of colorful landscaping stuff. As usual, we supply all the materials you need to make the scene as shown, including thorough instructions, templates and a photo. Finished size of the house is 3" x 6", finished size of the project is 6" x 8"...made to display in a standard 5" x 7" picture frame. You know those little houses they put at the mall at Christmas time? The ones where you can take your tykes for their Santa photos? Well, here you go.... A scalloped roof tops this little photo studio with its whimsical details. The walls are preformed, for easy assembly. The snowy ground and the cookie and candy decor are included--even the tiny candy canes and the gingerbread folks who welcome you to the door. Interior accessorizing is up to you. 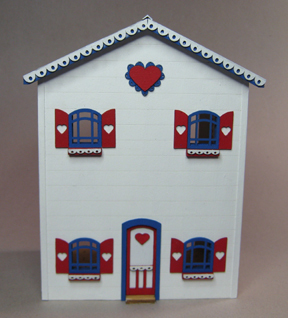 Finished house is 3-1/2" tall and the project can be inserted into a standard 5" x 7" picture frame. The rear wall can be left open or closed and walls are preformed, for easy assembly. Interior accessorizing is up to you. Foam "mounded ground" and all the fun details ("Halloweenie" wallpaper, pumpkins for the front porch, mailbox, rocks, plants and grass--even the tombstones for the front yard--are included). 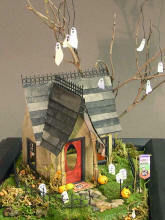 All you'll need to supply is a twiggy branch from your yard to use as the tree Finished house is 3-1/2" tall. The finished project can be inserted into a standard 5" x 7" picture frame. The cottage walls are made from a plastic cup (included in our kit), which makes it simple to create. Loads of details, including Grandt-Line windows and doors, added. There is plenty of landscaping material to plant in the pre-formed foam "ground" which is supplied. 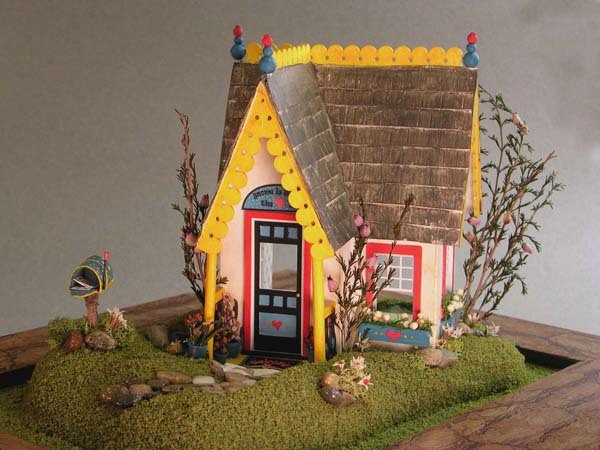 Just for fun, there is a tiny birdhouse that mimics the cottage and a little sign to place out front. 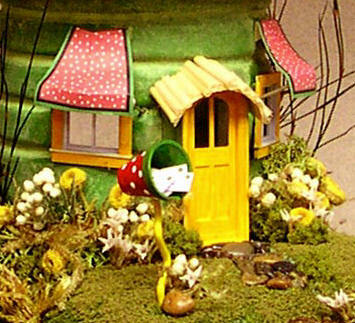 The roof is a bit off center to give this cottage a whimsical feel. Keep in mind that gnomes are little people, so the house reflects their size. The project base is designed to fit flat into a 5" x 7" picture frame. 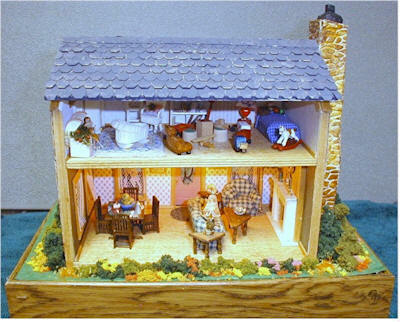 The house is 6-1/2" tall (that's including the cool roof). This is an intermediate level kit. It is 12:05 and Cindy has stayed too long at the ball! Here is the pumpkin carriage, with the little mice scurrying about. In this project, you will work with our pre-molded styrene pieces to create a scene from Cinderella: the clock has already chimed and our princess-to-be is late! Everything you need to create the project as shown in the photo is included, except for the picture frame which we suggest you use for a base. We even give you the little hill on which you will place your pumpkin carriage and the tiny mice who used to be the footman and driver. The completed project measures 5” x 7”. 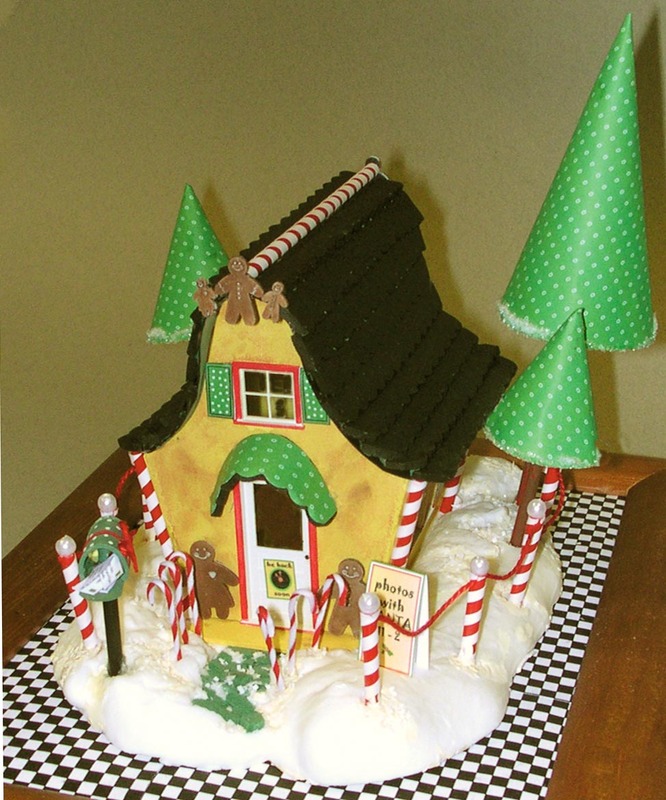 #3480 Hansel and Gretel, Beware! Say "Hello" to Fairy Land! 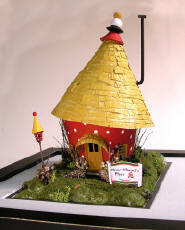 Imagine Hansel and Gretel traipsing through the forest and coming upon this yummy looking house! (Little do they know that the witch has an oven out back just waiting to receive the ingredients for her lunch.) As always, our project kit comes complete with everything needed to complete you scene, from the pre-formed “mound” right down to the gingerbread, gum drops and lollipops out front! There is even a potbelly stove and table and chairs inside. Our easy to follow instructions lead you through the steps, and we also supply hints for working with our materials. In this project, you will use our preformed walls, windows and doors, and add the finishing touches with some fun details. All you need to add is the picture frame which we suggest you use for a base. We even give you the little hill on which you will place your gnome’s home. The finished project measures 5” x 7”. These houses are special order. 3-story Japanese house with nine rooms (living room, kitchen, dining room, bedroom, bathroom, attic & three hallways. Comes with Shoji screen doors and windows that actually slide open and close and uses real rice paper. The floors are printed Tatami and wood. This house is unique in that two of the rooms are not viewed from the back but are viewed instead using windows and doors. The house is built floor by floor and the floors can be kept separate until all interior decorating is finished. The QS906 Veranda and QSA907 Entry Arch are available separately. Furniture is also available. This Veranda is typical of the type many houses in Japan are built on. This Veranda (deck) can be used for many other types of houses as well. This Entry Arch is said to bring Good Luck to all who enter. They make a wonderful addition to Japanese Gardens. a quaint little thatched 14th century cobblestone cottage. Her walls are sturdy, her hearth is warm. A charming cottage that you can have sitting on a cliff overlooking the ocean. With its spiral staircase and stained glass windows it truly is a peaceful place to hide-away to enjoy nature. Three story Wind Mill consists of a sloping, horizontally weather boarded or shingle tower with six sides. Everything shown in the photo except the landscaping. Base 8x8, house including 12" from bottom of base to top of fan blades. The kit comes complete with everything you need to build the shop, patio and sidewalk. It has laser cut basswood building, grapevine rails and posts, shingles, and a stained glass window and door. It also includes pre-printed bricks for the wall and building exterior, patio floor, interior wallpaper and even a printed inlayed wood floor. 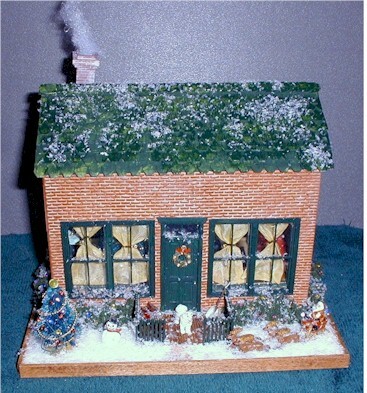 2-Story English Cottage with four rooms, an attic, two hall ways and a green house. The kit comes with the thatched roof, scribed wood floors, 3 interior doors, 2 exterior doors and the greenhouse door as well as all three windows. The steps, handrails, rock walls, cobblestone walkways, patio and all lattice also come with the kit. It even comes with the bicycle kit which is laser cut from wood. 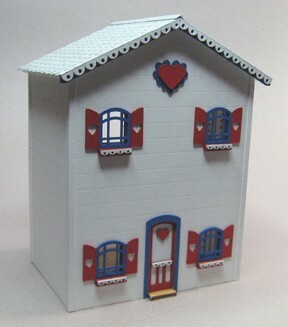 Some houses will be shipped from the manufacturers. All houses will ship Priority Mail, with insurance. Judith Dowden judith.a.dowden@hotmail.co.uk for Karen Cary House Kits. This awesome building is a replica of a shop with living quarters found in the French Quarter in New Orleans. The interior consists of 5 rooms and the exterior has a roof-top garden and a wrap-around balcony. The iron grill work really adds to the character of the building. 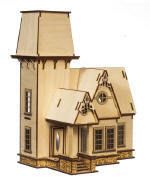 The kit includes everything in the pictures (windows, exterior doors, and shingles). All parts are laser pre-cut. Includes building, siding, roofing, wharf, pillars, tie-downs, window flower boxes, windows, doors, stairs, stove pipe, porch step, trim & fish-shaped sign. Includes building, brick flooring, fireplace, bridge, doors and faux iron gate. Directions are included so you can make the glowing embers and the wall sconces. Has clear polycarbonate top and front. Perfect for display or for making an actual room. Includes everything seen above. Please be aware that these houses are hand cut, NOT laser. I design my kits to be BASIC. If you want to change the windows or doors, you can do so. They can be adapted easily into other styles by choosing different windows, siding, roofing, porches or other architectural styles. 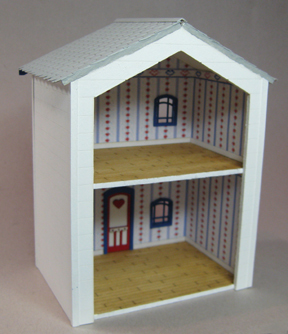 The kits can be made up using your choice of windows, doors, etc. The price may vary slightly but it shouldn't be much. Kit includes: Basic house kit (walls, floors, roof), 3 windows and 1 door choice of stone, brick or rough brick, square roof shingles scribed wood flooring, baseboard, and crown molding. Chimney is not included however a pattern for tall chimney is enclosed. Kit Includes: The Church structure, foam core interior structure, wood flooring (including stage), windows, roof shingles, moldings, pews & chairs, podium kit, several pictures to choose for the walls, siding. People can be purchased separately. Kit special, when you buy a kit, Painted figures, Six for $25. To see Grace's finished Church, click here. 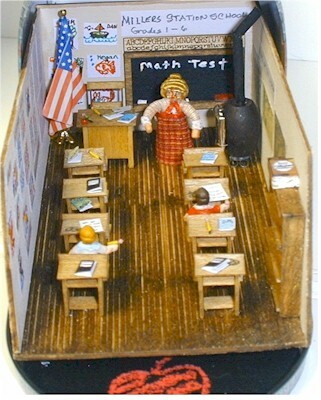 Teacher by Jan Stockwell Please note that dolls may differ slightly. The shape of the roombox is horizontal, different from the completed one shown above.